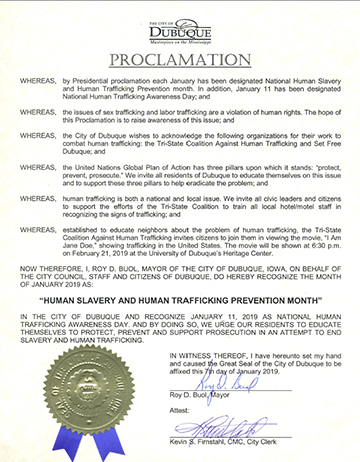 Sister Joy Peterson holds the proclamation declaring it Human Trafficking and Human Slavery Prevention month in Dubuque. 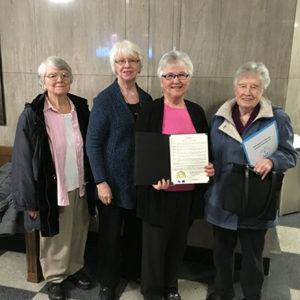 At the Dubuque City Council Meeting on January 7, Dubuque Presentation Sister Joy Peterson, and Franciscan Sister Mary Lechtenberg represented the Coalition Against Human Trafficking in the Tri-State Area as the City Council proclaimed January 2019 “Human Slavery and Human Trafficking Prevention Month” in the city of Dubuque and January 11, 2019, as “National Human Trafficking Awareness Day.” The coalition was founded by the communities of women religious along the Iowa/Wisconsin/Illinois border five years ago. The Dubuque Sisters of the Presentation are a part of this coalition. The group engages in education and advocacy to eradicate human trafficking. Recently the coalition announced a local campaign to train hotel and motel staffs to recognize the signs of human trafficking. The training will be done in conjunction with the Iowa Network Against Human Trafficking and Slavery, and the Coalition on Human Trafficking of Omaha, Nebraska.The campaign’s goal is to help employees realize, recognize and respond appropriately when they see signs of trafficking. Read more at KWWL story on awareness campaign.